Local government is a great place to make a living. Although the odds of getting rich are slim, public service provides a stable income and attractive benefits that are unmatched by most other lines of work. In rural areas, a local government job is often one of the best gigs in town. And it isn’t too shabby in a big city, either. Here are some of the reasons to work in local government. Many people work in local government to make a difference in their communities. 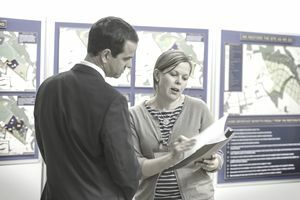 Local public servants see the effects of their work in the lives of citizens. For example, firefighters rush to vehicle crashes, fires, and other emergencies only a few miles from their homes. On an emergency call, firefighters might rescue someone they know including family members, friends, and neighbors. No matter who they pull out of a totaled vehicle, apartment building, house or business, firefighters meet the urgent needs of their fellow community members. Of course, most local government jobs don't require risking severe injury and death. Nonetheless, public servants at the local level directly serve members of their communities. For example, school teachers instruct students whose families may attend their same churches, shop at the same grocery stores, or play at the same parks. Public servants do not have to work directly with citizens like firefighters and school teacher to have an impact on their communities. Accountants and internal auditors ensure tax dollars are spent legally, making sure expenditures are accounted for and available for public scrutiny. Each public servant plays a role in delivering the goods and services provided by local government and can see first hand how their efforts have benefited the lives of others in the community. Not only can you serve your neighbors through local government service, but you can also work alongside your neighbors. For example, police officers can choose to live in the part of town they most frequently patrol. In addition to doing their duty for the reasons all other police officers do, they have a vested interest in making their parts of town safe. People in urban and suburban cities commute many miles per day getting to and from jobs working with people from various places within the metropolitan area. Suburban communities and satellite offices in large cities give employees the opportunity to work where they live. Local government offers a vast variety of jobs. We have already mentioned several positions: firefighter, police officer, and school teacher; and there are countless others such as recreation coordinator, public information officer, a sanitation worker, social worker, and probation officer. There are jobs within each department whereby you might work in an office for the mayor, the social service department, senior citizen center, or the library. No matter your skill set, there is an excellent chance you can put it to productive use in local government. There are plenty of positions that require strong math and science skills. There are other positions where you could help to prevent and investigate crime as an employee of a police department or sheriff's office. Jobs at all levels of government have generous benefits packages. What government jobs lack in salary, they make up for in vacation leave, sick leave, retirement benefits, pension, and health insurance. A typical government employee’s standard of living might decrease if that employee were to accept a position in the private sector with the same or slightly higher salary due to the fabulous benefits. When estimating the value of a local government job, it's important to consider all of the benefits both today and in the long-term and not only the current salary.